Detectives investigating devices sent to addresses in London and Glasgow have said a claim of responsibility has been made in the name of the “IRA”. A joint statement from Police Scotland and the Metropolitan Police said the claim of “IRA” responsibility was received on Monday by the Belfast-based Irish News. A recognised codeword was used. 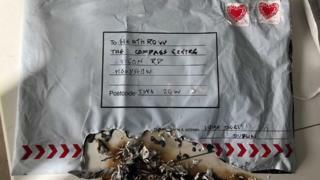 It added: “Given the packages received last week bore similarities to devices sent in the past which were linked to dissident groups associated with Northern Ireland-related terrorism, officers were already looking at this as a line of inquiry. However, we continue to keep an open mind and enquiries continue. “Extensive advice has already been issued to relevant businesses and sectors to be vigilant for and report suspicious packages to police. This advice was previously sent to armed forces personnel and is being reiterated again in light of this claim. Who are ‘the new IRA’? It is currently classified as “moderate”, meaning attacks are possible, but not likely. It is often referred to as “the new IRA”, to distinguish it from the group which was active in Northern Ireland’s troubles. It is comprised of dissidents who never accepted its namesake’s ceasefire more than 20 years ago. They have described it as “a small” organisation, perhaps with 50 or so actively engaging in terrorist activity. On 5 March, three “small improvised explosive devices” were found at sites across London.